Lost iPhone Contacts, Photos, Text Messages, Call history, Notes, etc. by Accident? Have you ever found your iPhone files disappeared due to accidental deletion or other unknown reasons? And mis-operation on iOS or App update can also cause destructive iPhone data loss which includes contacts, photos, text messages, notes, reminders and more. Are you wondering if it’s possible to recover erased information from your iPhone? Or are you regret at not having backed your iPhone up before data loss? Don’t worry! You can easily recover deleted or lost contacts, photos, text messages and other 16 kinds of iPhone files with Tenorshare iPhone data recovery. Tenorshare iPhone Data Recovery (http://www.tenorshare.com/products/iphone-data-recovery-win.html) is an ultimate iOS data recovery tool that gives promises of privacy security, zero quality loss and 100% data recovery safety on your iPhone 6 Plus/6/5S/5C/5/4S. What’s more, you can use the FREE trial before finally purchasing its full version. Why so many people recommend Tenorshare iPhone data recovery software to lost iPhone data? Read the 7 outstanding features below, you’ll answer the question yourself. 1. 3 Recovery modes applying to ALL situations. It offers you 3 recovery modes as follows. Recover data from iOS device: Enable you to directly recover lost iPhone data without any backup before. 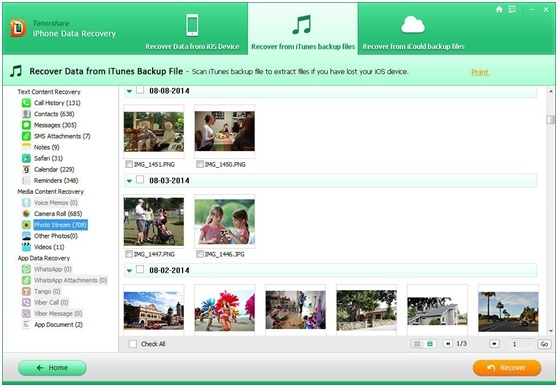 Recover from iTunes backup files: Allow you to recover lost data from broken/damaged iPhone. Recover from iCloud backup files: Empower you to retrieve lost iPhone data without iPhone at hand. You can preview both the lost and existing data from the program’s main screen, namely, you can tell whether the lost iPhone data are recoverable. Through the Preview feature, you can selectively recover those data you want to get back rather than all of them as the traditional iTunes do. Its print feature allows you to directly print photos, contacts, notes and text messages from your computer. Aside from recover lost data from iPhone, it also supports recovering lost or deleted iTunes or iCloud backup from the computer with which you backed up your iPhone. Different from the normal App, iPhone Data Recovery is PC-based software. Considering the great demands of Mac users, there’s also an equivalent Mac version: iPhone Data Recovery for Mac (http://www.tenorshare.com/products/iphone-data-recovery-mac.html) Make sure to download the right version for free trial. And if you encounter other problems after downloading, you can contact Tenorshare Support by sending emails to angel@tenorshare.com. Related to "Tenorshare iPhone Data Recovery – Recover Lost Files from iPhone 6 Plus/6/5S/5C/5/4S"
Are Sales On Your Website Poor? Read This NOW!